Ah, the holiday season. A time for family traditions, and cozy holiday parties. A time for tacky sweaters and eggnog. A time for togetherness and joy. When I think about my favorite parts of this season, I think of days spent lounging in cozy PJs with my loved ones, hot cocoa in hand. Memories of my mom’s famous (seriously melt-in-your mouth-good) chocolate chip pie spring to mind. And I can almost taste the cool peppermint tingly sensation of that first candy cane of the year. But things are not all merry and bright. All that focus on sweet treats and fun food has become muddled and confusing for the majority of us. Why? Two words- diet. culture. Diet culture is a legit Grinch. It’s voice is there, in all of our ears, all year long. But come holiday season, grinchy scroogey diet culture capitalizes on our food focus by getting even louder. “Don’t eat those sugar cookies,” diet culture will hiss. That diet culture voice can be a real bummer right? Seriously, when did we all start to forgo our beautiful family food traditions? When did eating a sugar cookie become synonymous with immediately contracting a fatal illness? Fatphobia is probably the driving force behind the diet culture hoopla. We are a culture that has become quite obsessed with the thin ideal- and quite oppressive towards anyone in a larger body. Our culture dehumanizes fat folks, and holds up thinness as some type of medal to constantly be working towards. The most absurd part of all of this is that none of it is based off of any type of real information! The studies that link larger body size with mortality/various illnesses are often not empirically based. We are essentially, as culture, operating on very lazy science. And that lazy science impacts everyone. Just look at our obsession with avoiding holiday weight gain. Everywhere we turn there is another article about how to cut calories to avoid gaining x number of pounds this December. The low sugar cakes and keto-friendly cookies are everywhere. Diet culture and fatphobia have officially taken over the holiday season. However- (aren’t you glad there is a however? Things were gettin’ gloomy there for a second) there is another way. Legalize eating for joy. Eating is for more than fuel. All of the macro-counting/clean eating BS is wrong. Food was never meant to just be fuel. As humans, we have always used food in various other ways. We use it for mourning, for socializing, for comfort, and yes-for celebrating holidays. This season, remind yourself over and over that you are allowed to have the cookie just because it tastes good. You are allowed to eat past fullness because the food is delicious AF. You are allowed to love the pie, candy canes, and the ‘nog-regardless of their “nutritional value” or macro count. Embrace Health at Every Size (HAES®). Health at Every Size is a weight neutral approach to health care. It does not center on the philosophy that all humans are healthy at every single size, but rather promotes the right for all humans to be able to seek health in a weight neutral manner. It also upholds the fact that the medical model of a “healthy” body size is far too narrow-and that human beings can be healthy in a huge range of sizes. The best gift you could give to yourself this holiday season is Linda Bacon’s book: Health at Every Size: The Surprising Truth About Your Weight. Reading this will be helpful in tuning out the fatphobia rhetoric and tuning into enjoying your holiday par-tay. Adopt a new mantra. 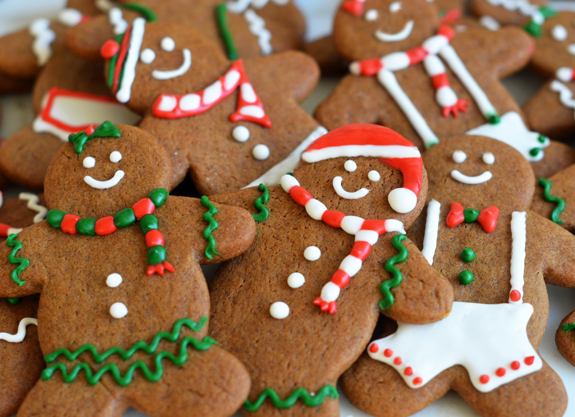 “You know what is healthier than paleo-running-man-protein Christmas cookies? Having a good relationship with food.” This needs to be something that you repeat to yourself on the reg. Research tells us that constant stress and guilt about eating can manifest as symptoms that mirror food sensitivities. You can eat all the kale smoothies you want, but at the end of the day, if your relationship with food is largely fearful- your health will be compromised. Remind yourself of this when others are engaging in the diet/wellness chatter at the office party. Remind yourself that health-true health-is wholistic in nature. It takes into account your mental and emotional wellbeing, relationships, passions, and overall ability to fully engage in life. Have compassion for those who are still caught up in the diet mentality-they haven’t yet discovered the secret- that is, the best thing you can do for your health this holiday season is to enjoy the season and the food. So, there you have it. Three tips to tune out the diet culture noise, so that you can tune into what really matters this holiday season. Eat the cookies, drink the sweet drinks. Let’s work to take back our joy around the holidays.